Hello Trick lovers, today we are going to tell you about the “Top 12 best android hacking apps of 2016“, So let’s have a look on these top android hacking tools. Technology is growing rapidly day by day and that time has come, when a hacker doesn’t need a computer to hack someone’s phone, password etc. Because now hacking is also possible on the Android phones, the hacker just need to root their phone and should have some knowledge about hacking to hack using an Android phone. Techie peoples are attracted more towards hacking knowledge. As the security is growing to the next level hacking is also growing along with security. Hackers create different ways to break the security and the hacking now became easier in comparison to the past time. Android is the best android system with no doubt, but it has some applications which are the topic of concerns to security purpose. We are writing this article only for information and security research purpose. So it is advised that don’t misuse these apps in any manner. Note: The information we are sharing in this article is intended to empower the security research, and we are not responsible for any misuse of the information given below. The list of best android hacking apps is given below, we will write a short description for all the android hacking tools we have provided below. As the name suggests Android + Rat (Remote access tool), it is the mixture of Android and Rat. It is a client-server application, this application is developed in java android for the client side and in java swing for the server. The application has many features such as monitoring received a message in life, do a toast etc. The application “DroidBox” is developed for the dynamic analysis of the android applications. Hackode is an android application for the penetration tester, IT administrators, ethical hackers, and cyber security professional to perform different tasks like reconnaissance. The Burp Suite is an integrated platform for performing security testing of the web applications, it’s various tools works seamlessly together to support the entire testing process, from initial mapping and analysis an application’s attack surface. Burp suite gives the user full control and letting the user combine advanced manual techniques with state-of-the-art automation, to make your work faster and effective. Droid sheep is an application for security analysis in wireless networks, the application is developed by Andres Koch. The Droid Sheep app basically is a session hijacking tool that allows the hacker to capture session cookies over the wireless network. Shark for root is a traffic sniffer which works for 3G AND WiFi, to open dump use Wireshark or similar software. The application is based on TCP dump and is available on google play. zANTI is a mobile penetration testing toolkit that lets security managers access the risk level of a network with the push of a button. The Dsploit is an Android network analysis and penetration suite which aims to offer to IT security experts. This is the most advanced professional toolkit to perform network security assessments on a mobile phone. Dsploit allows user map their network, fingerprint alive host operating system, and running services. APKinspector is a powerful GUI tool for analyzing the Android applications. The goal of this tool is to aid analysts and reverse engineers to visualize compiled Android packages and their corresponding DEX code. Arpspoof is a tool for network auditing. The app redirects traffic on the local network by forging ARP replies and sending them to all hosts or a specific target on the local network paths. SSHDroid is a server implementation for Android devices, this application allows users to connect to their device from a PC and execute commands. The SSHDroid is basically a combination of SSH and Android, SSH(security shell) is the best protocol that provides an extra layer of security while you connect with your PC remotely. The Appuse virtual machine is developed by the AppSec labs. The system is unique and free platform for mobile application security testing in the in the Android environment and also it includes unique custom made tools created by AppSec Labs. So above we have told you about the most popular and Best Android Hacking Apps. 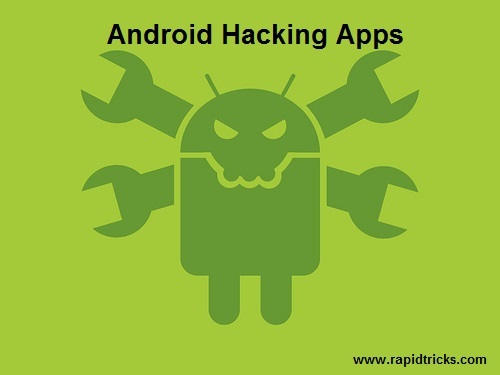 These applications are most using applications by the Android hacker. If you like the article then don’t forget to share it because “sharing is caring”. Stay connected with us for more cool tips&tricks and useful information. So like, subscribe, follow us on social media for instant and regular updates of new articles.